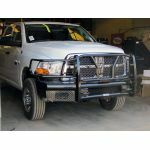 In classic cowboy style the Vaquero is a no frills cattle pushin front end replacement bumper by Road Armor. 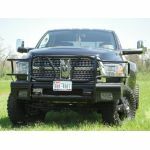 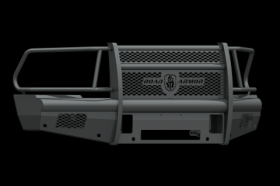 This modular front bumper accommodate the factory fog lights when equipped and also accommodates the OEM tow hooks. 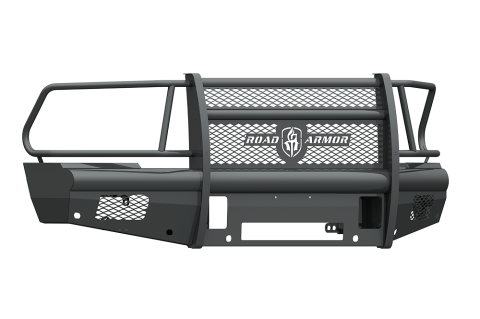 We build this rugged beast using 11 gauge smooth steel for the outer shell, 1/4-inch gusseting and bracketry and the classic beefy Schedule 40 pipe. 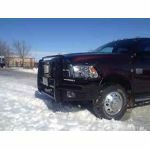 If this is your style but you want something a little different, a little more refined perhaps, or just want to own the baddest bumper on the market by the name the world trusts for dependability and quality, this one's for you.